Squeegee is a 1/4" minus aggregate. It is about the size of a BB pellet, with a small amount of sand in it. 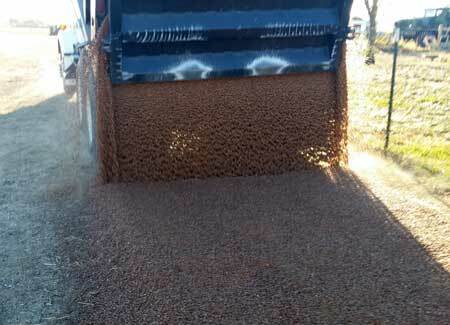 It is the material size between concrete sand and pea gravel. 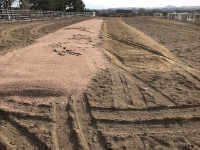 It is used for dog runs, play grounds, walk ways, fire pits, landscaping and to blend with sand in horse arena's and round pens. 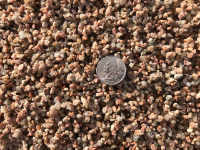 Left: Squeege with quarter, showing actual size of rock. Right: Installation of Squeegee with sand in an arena. 1 ton of squeegee covers 100 square feet 2 inches deep. Please note: This is only a rough indication of the amount of material you may need. Actual dimensions may vary due to irregularities in soil types and established rough grade.